He Teatro Real He has completed fiscal year 2017 with a surplus 200.000 euros, which it is three consecutive years of positive results. the success of its management model consolidates, it has achieved in the last five years a notable increase in ticket sales and sponsorship, and its position as the leading institution performing arts and music. The provisional revenue settlement totals 52.487.558 euros, a higher figure 2.471.947 euros to close budget 2016. One of the games that have recorded higher growth during the year 2017 It has been to income sales, with a total of 22.365.478 euros, It has increased by 9% Over the previous year. As regards Sponsorship and Patronage, the total figure reached 13.759.497 euros, from contributions from sponsors, of the various forms of patronage and galas, donations and contributions in kind. The Royal Theater will this year with a budget of 55.523.710 euros, with increased revenues 3.036.152 euros compared to 2017. Of the revenue for 2018 only 25,4% It corresponds to the contribution of Public Administrations, which it remains in the same figure for the previous year, with 14.110.239 euros. He 74,6% of the budget It comes from the revenue generated by the institution and sponsorship contributions, noting that, for the first time, more of 50% del presupuesto corresponde a ingresos generados por la venta de entradas y obtenidos por otros conceptos como el Space rental, training courses, rental and sale of own productions and audiovisual rights, among others. The budget allocated to the productions will be 21.813.771 euros, with an outstanding artistic programming integrated in the activities commemorating the bicentenary of the Royal Theater. Along the 2018 Royal Theater has scheduled 250 functions They comprising part of the programming of the seasons 2017-2018 Y 2018-2019. Of them 112 belong to 13 operas, 11 in dramatized version 2 in concert, among which include 8 new productions and essential titles that are not yet included in the musical heritage of the Royal Theater, as The soldiers, de Berne Alois Zimmermann; Dead Man Walking, de Jake Heggie; Gloriana, Benjamin Britten, Y Street Scene, Kurt Weill. La presente temporada cuenta también con el estreno mundial de The painter, Juan José Colomer, in collaboration with the Canal Theater. To these works must be added the securities included in the start of the season 2018-2019, whose programming will be announced next April. Likewise, in 2018 Royal Theater will host 4 ballets large dance companies, 15 concerts and recitals, 2 operas and film 8 children's shows integrated into the program Royal Junior, including family and school sessions. As part of the policy of opening the Royal Theater to new audiences, plan activities 2018 It includes the celebration, next July, the fourth edition of Universal Music Festival and of the Opera Week con iniciativas de muy distinto perfil y alcance, as open days, contests on social networks and free shows streaming. Along with that the institution will continue broadcasting a wide range of institutions within and outside Spain, and schools in different regions. 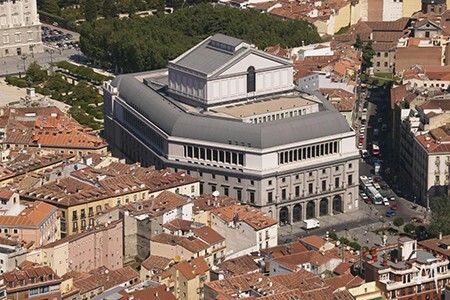 Likewise, entre los acontecimientos más destacados en 2018, el Teatro Real se convertirá en el centro mundial de la ópera con la celebración, between 12 and the 15 of April, de la primera reunión internacional del World Opera Forum, to convene 150 opera houses around the world, de las tres grandes asociaciones mundiales de ópera: opera America, Opera Opera Latin America and Europe, y a profesionales e instituciones de los cinco continentes para para trazar el devenir de la ópera en el siglo XXI.